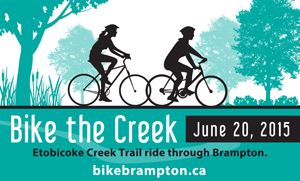 Bike Brampton Newsletter - Bike the Creek this Saturday! Register for Bike the Creek - it's free! You are receiving this email because you have subscribed to the newsletters of Bike Brampton (Brampton Bicycle Advisory Committee). If you do not think you have subscribed, or if you ever change your mind, you may unsubscribe safely using the link below. We strive to make our content relevant, since we believe that "biking in Brampton builds our community". June is Bike Month and our premier event is "Bike the Creek". Do come out and enjoy the fun on Saturday June 20th! for the registration link and all the details! We have articles on Bike the Creek, Brampton Kids on Bikes, Is a Bike Helmet worth it?, Community Bike Centre, Critical Mass, Economic Benefits of active transportation, and much more!